I’ve briefly mentioned my Steam controller in the last couple of posts I’ve written, and I feel that I’ve used it enough to form some solid opinions of it. First and foremost, I should make it clear that I am very much a PC gamer. A mouse and keyboard are what I feel most comfortable with, what I’ve been playing games on for decades. I’ve used console controllers before but I’ve never gotten used to them. They just feel…clunky and awkward to me. I actually refused to play FPSes for years due to only trying them out on consoles and absolutely sucking at them. It wasn’t until I played one on a PC that I felt competent enough to actually enjoy myself. So I think it’s safe to say that controllers and I aren’t the best of friends. But then came along my carpal tunnel (which I know I’ve been going on about for months) and I needed to change things up if I wanted to still play games. This first lead me to using my Xbox 360 controller with the program Pinnacle Game Profiler. I wasn’t sure how well the set up would work so I downloaded the trial version and spent some time using this combo to play The Sims 3. And it turned out better than I expected so I bought the program on sale for $10 (it seems to go on sale frequently). The controller helped reduce the strain on my hands and wrists due to the more natural position I could hold them in and the fact that my thumbs were doing most of the work. Since other gamers can post their game profiles on the Pinnacle site, it was easy to download one and get started with a game right away. For a while, it was enough. But then some problems came to the surface. While the Xbox controller is more ergonomic than a keyboard/mouse, it’s still not great. Seriously, why is the right analog stick set lower and further in than the left analog stick? If I’m moving a character and camera around a lot, the controller is always tilted in my hands. And I have never liked analog sticks: I’ve always felt they were inaccurate and handled movement strangely. With the carpal tunnel, there was the added issue of them hurting my tender fingertips. As for the Pinnacle program, while it’s incredibly useful and pretty cheap, I did find it somewhat confusing when it came to customizing the controls. If you don’t mind just downloading profiles and using them as is, it’s no problem. But switching out bindings or starting your own profiles from scratch is not an activity for beginners. 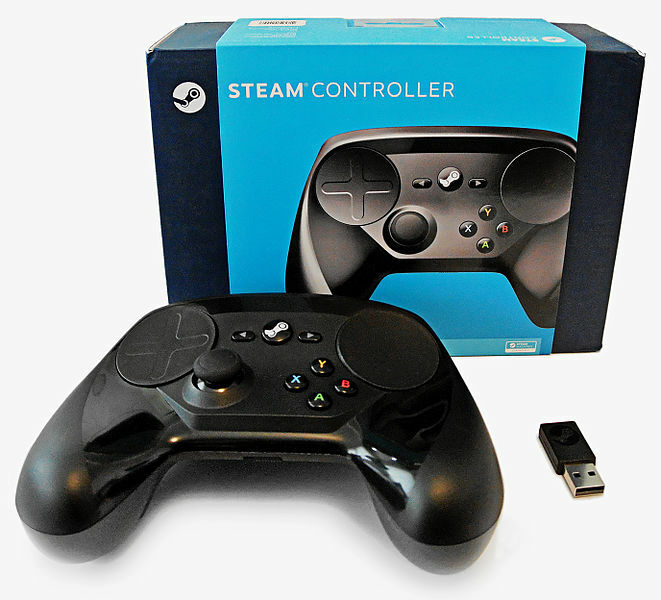 One day I was complaining about this to Lord Crumb and he mentioned the Steam controller. I knew that it had been selling for months but it never occurred to me to try one. He said that the reviews he had read were mixed so he wasn’t sure if the controller was good or bad. But I figured I’d give it a shot anyways and picked one up at my local EB Games. This might be weird but the first thing I was impressed by was the packaging. It came in a nice cardboard box rather than one of those plastic packages that needs to be opened with scissors and that I always manage to cut myself on (I can’t be the only one who hates those). Besides the controller itself, the box contained a wireless USB dongle, a dock for the dongle, a microUSB cord, two AA batteries, and the instruction manuals. Maybe it’s because I’m behind a console generation with my Xbox 360, but I really like the fact that I can choose between a wireless or wired controller right from the get go. Being able to use regular old AA batteries instead of a specialized battery pack is also nice, and I can’t remember the last time I bought something that actually came with AA batteries included. The controller has been nicely designed and feels very natural in the hands. It has the standard two triggers, two bumpers, four action buttons, and a Steam menu button between the start and back buttons. But instead of the two analog sticks and a D-pad, there are two clickable trackpads and one analog stick. There are also two flippers/bumpers (I don’t know what they’re suppose to be called) over where the batteries go in the back, which gives you two more buttons than a regular controller. Now, it seems like in the reviews I read, the main issue people generally had were the two trackpads. And I suppose that if you’re used to a console controller with its analog sticks, the trackpads do operate a lot differently. And if that’s the problem, why not use your regular console controller with Pinnacle to play your games? Anyways, the trackpads operate a lot like the trackpad that most laptops come with, only better. I find that the stiffer plastic makes it easier to move my thumb across as opposed to whatever laptop trackpads are made of. And if I flick my thumb across quickly, it operates like a trackball and “rolls” the cursor to a slow stop even after my thumb has left the pad. Both trackpads also have the ability to give haptic feedback, which I had no clue what that actually meant until I used it. What it means is that when I move my thumb across the trackpad, there’s a quiet sound (I likened it to a Geiger counter)and slight rumble letting me know that it’s detecting my movement and how quickly/slowly my thumb is moving. The faster the motion, the quicker the feedback. I know it’s probably hard to figure out what I mean about the haptic feedback, so short of putting the actual controller in your hands, here’s a brief video someone made of the sound (on an older version of the Steam controller). Personally, I love the trackpads. While they took me a little while to get used to, I found them much more accurate than the analog sticks since they’re more analogous to a mouse. In fact, I always set up the bindings so that the trackpads are used for movement and camera control, with the analog stick relegated to the what would be a D-pad on a regular controller. Speaking of bindings, there’s a ridiculous amount of customization when it comes to configuring it for games. 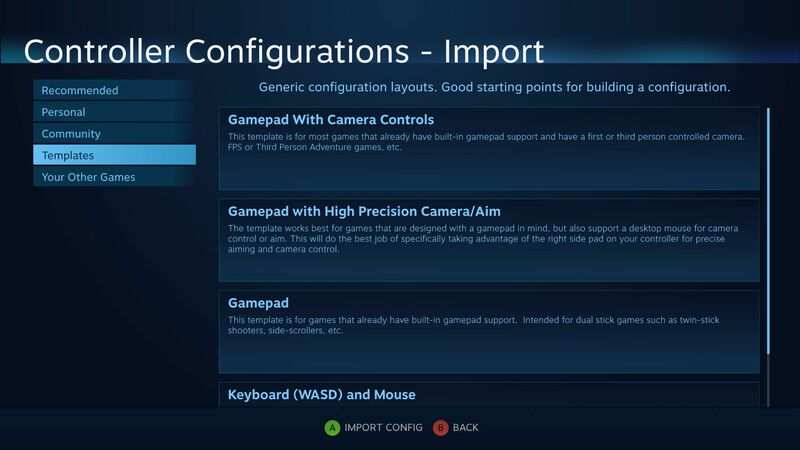 I’ve found the Steam controller configuration interface to be simple enough on the surface for a beginner to figure out, yet have enough options under the hood to let you really customize it the way you like. To start, there’s usually some sort of profile available for every Steam game. There might be one recommended by the game developers themselves. There’s almost always a couple that have been created and shared by other users who play the game. And if absolutely no one has published a profile (or one that you like), there are some default templates that can be customized for that game. Once a profile has been imported, it can be customized however you like and saved to your Steam account. 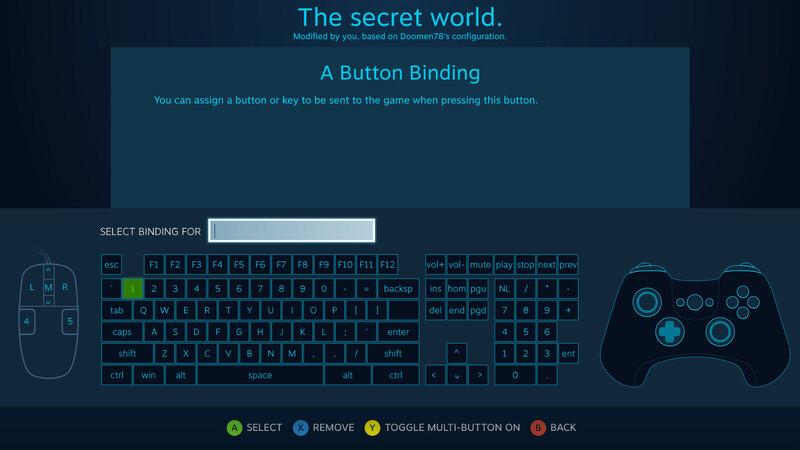 The clickable images of a mouse, a keyboard, and a standard game controller make it very easy to pick new bindings. The only thing that I find lacking is the ability to drag-and-drop bindings from one button to another. It would make switching the bindings for the left trackpad and analog stick so much easier. 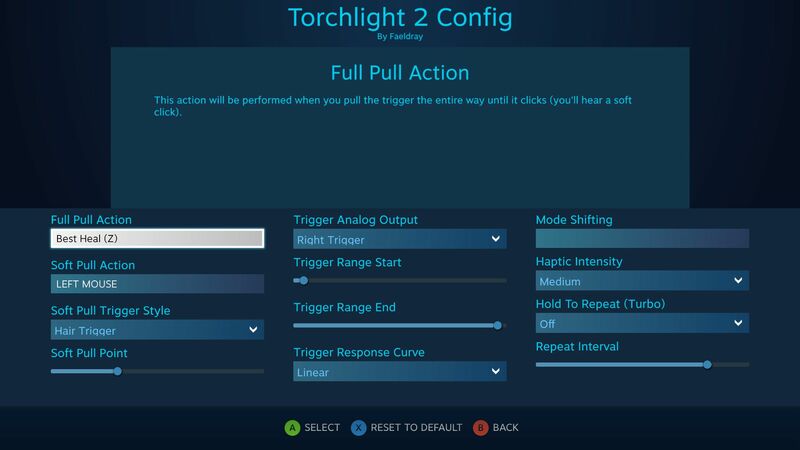 This controller also has a bunch of subtle options that aren’t available on regular controllers. For example, the triggers have both a “hard” press and a “soft” press. Holding the trigger down less than halfway is a soft press, holding it down more is a hard press and there’s a click that be felt when a hard press is done. Each type of press can have its own bindings, something I found this useful in Torchlight 2. The soft press for my left trigger is my standard attack, but if I find my health is suddenly dropping, I just have to do a hard press to drink a health potion, all the while still continuing to attack. MMOs can have some odd controls so it’s good that the trackpads are so versatile. The Elder Scrolls Online has a sprinting ability so on my left trackpad (used for WASD movement), I bound the clicking action to the sprint key. Just touching the trackpad makes my character move normally, pressing down makes her sprint as well. In The Secret World, moving the camera requires holding down the right mouse button. So I set right-click to the touch binding on the right trackpad so the camera can be turned without pressing down on anything. Need more buttons than the controller has? A trackpad can be setup to use a touch menu, which can have up to 16 buttons on it. I’ve even seen a setup where one of the back bumpers needed to be clicked before the touch menu appeared, so the trackpad could be used for other bindings normally. 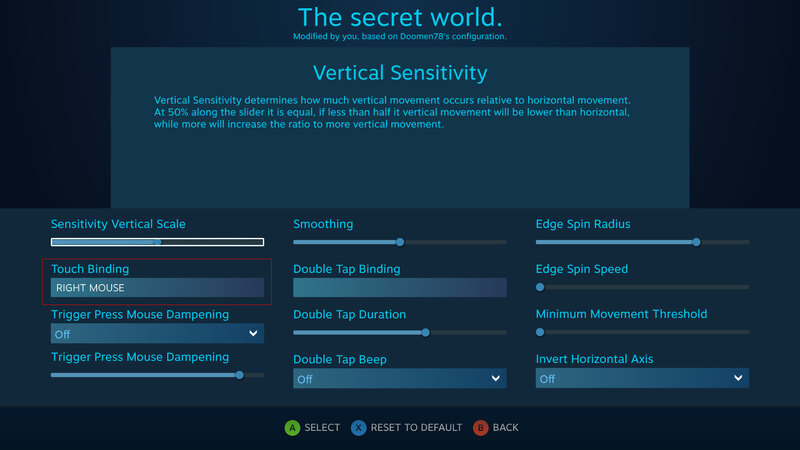 To top it all off, I just found out today that there’s also a gyrometer inside the controller, meaning that it can used for motion control and fine-tuning accuracy. So do I think my purchase of the Steam controller was worth it? Absolutely. It may never replace my mouse and keyboard but I think I’ll continue to use it even after my carpal tunnel is long gone. I’d like to be able to stream some games to a big screen TV and lounge back on the couch like a console gamer. While it was certainly cheaper to buy the Pinnacle software and use the Xbox controller I already owned, playing games is much less frustrating and more enjoyable with the Steam controller. I’m not saying it doesn’t have its downsides. The controller can only be used through Steam so any non-Steam games will have to be added through there. 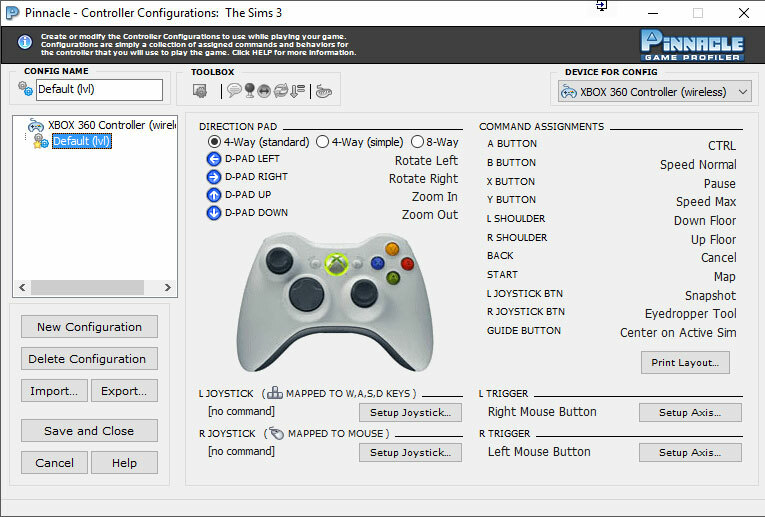 I was able to configure the controller for The Sims 3 (I own it on Origin) without much issue so it’s not a major hurtle. There have been times when my bindings wouldn’t save properly and once where the controller turning off caused the game to crash, but the problems have been few and far between. There’s also the fact that it does take some time to get used to using, which can be frustrating. And if you switch between games a lot that have wildly varying configs, you’re probably going to press a lot of the wrong buttons at first. 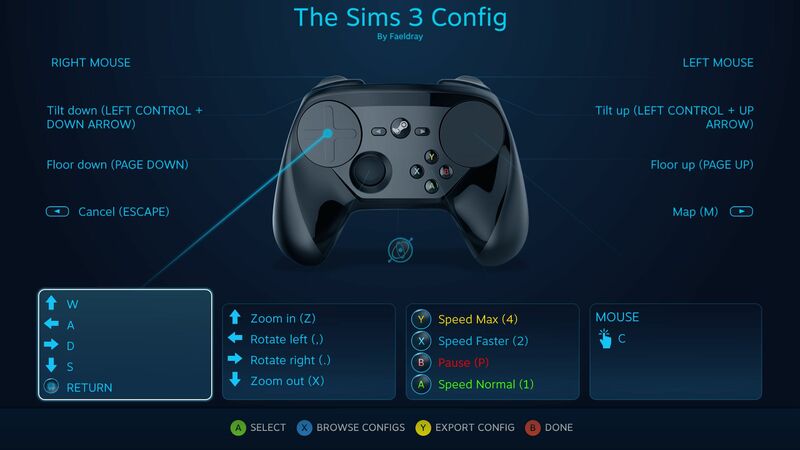 There’s no doubt that the Steam controller is different than your standard console controller. And that’s likely why it’s getting mixed reviews. But I don’t think it was made for people who are happy with their console controllers. I think it was made for us PC gamers who are looking for a console-like experience with large TVs and comfy couches. If you’re in the former group, give Pinnacle Game Profiler a try first. If you’re in the latter, I think that, like me, you’ll find the Steam controller so much better.